Our non-profit has worked with money-in-politics researchers since we ran OpenCongress from 2006 through 2013 – including OpenSecrets, Sunlight, FollowTheMoney, MapLight, LittleSis and others. Even with the progress of digital #opengov & #opendata movements since 2007 or so, there’s tons more work to do in making arcane FEC data more accessible and finding meaning in campaign finance haystacks. Fortunately, civic hackers & data scientists are still working on popularizing powerful & shareable tools. 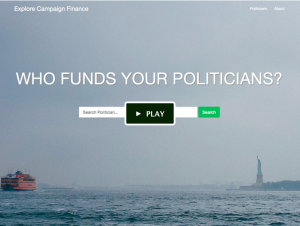 You’re invited to join me at Civic Hall in Manhattan this Thursday, May 28th, at 12:30 pm for a “brown-bag” lunch with Solomon Kahn, creator of a now-running Kickstarter campaign for an awesome new tool, “Explore Campaign Finance”. Don’t miss out on the video demo – it seems to me this offers unique value as a data-viz and open-data public resource – Solomon is a Brooklyn-based data scientist, more about his projects. In short: campaign donation data comes from FEC to OpenSecrets in sectors and industries, and this tool enables viz & browsing far more easily by industry – and dive in to individual donor entities such as Blackstone Group. He’s also enabled a similar high-leverage feature we did on OpenCongress, which is allowing user-generated comments surfacing insights & research findings directly on profile pages of elected officials and candidates – this can get really compelling. (Not unlike the inspirational LittleSis! Hey, Solomon has previously collaborated a bit with CH member og. DataKind too, it seems, on a U.S. budget viz.) PPF’s work on OpenCongress was the first non-profit site to display campaign donation info from OpenSecrets on the same profile pages for members of Congress (from GovTrack) with bill & committee info, with added news & blog coverage, user comments, wiki content, and later, unique-value MapLight research. 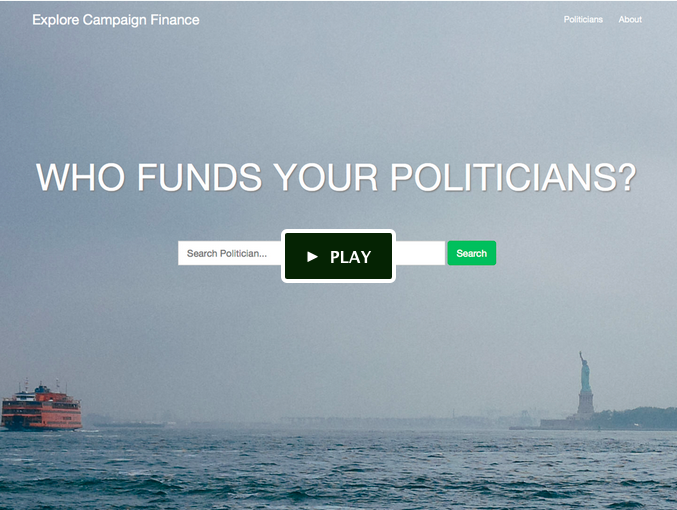 With this Kickstarter funding, my former OpenCongress colleague Donny Shaw will consult for Solomon for a couple months on outreach to campaign-finance researchers & reporters & political bloggers. It’s extremely generous of Solomon to offer this valuable resource free of charge & libre to the public, with basic funding going to outreach & hosting costs – he’s already gotten Twttr shout-outs from Prof. Lawrence Lessig and (CH member) Tim Karr of FreePress. So, a bunch of great partnerships happening around this. A lot of new legislative-body-research services launching in the past six months are closed-data and subscription-based, so if you can, please contribute to support important work that’s free & open to the public.